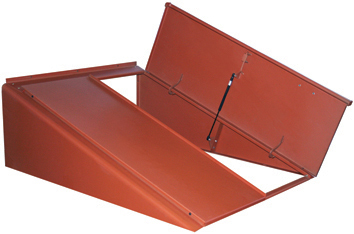 We install Bilco® and Gordon® bulkhead doors. We repair concrete foundations. Pricing is dependent on the extent of the work to be performed. We use Silverline (a subdivision of Andersen®) vinyl windows, either sliding or hopper, double-glazed. Each window is manufactured to fit your opening. It is important to have an insulated, weather-stripped door at the bottom of the hatchway stairs. The basement area of a home typically produces warm, moist air. A door that is not insulated or properly weather-stripped causes warm, moist air to leak through the door, causing condensation on the bulkhead door, giving it the appearance that the door is leaking. For an additional fee, we will replace the entrance door at the bottom of the stairs. We will excavate, cut the foundation, and install pre-cast concrete stairways. This service includes an insulated door at the bottom of the stairs, as well as finish gradework and seeding.